As for me I don't like Mio more that the other three, in fact I don't see what she has in more than the other girls. so we all agree (except for the guy above me) that Mio is the best by far right? haha. her shyness completely slays me. it'll be interesting to see her transformation to lead singer.. you know its going to happen based on the ending..
was like "ohhh black haired beauty!! watching!!!" I love shy characters and Mio is no exception. After the second episode is impossible not to consider her as the best character of the series! I'm waiting to see the episode where she will sing for the other characters for the first time! Whenever Mio and Ritsu are together, they just remind me of Kagami and Konata. 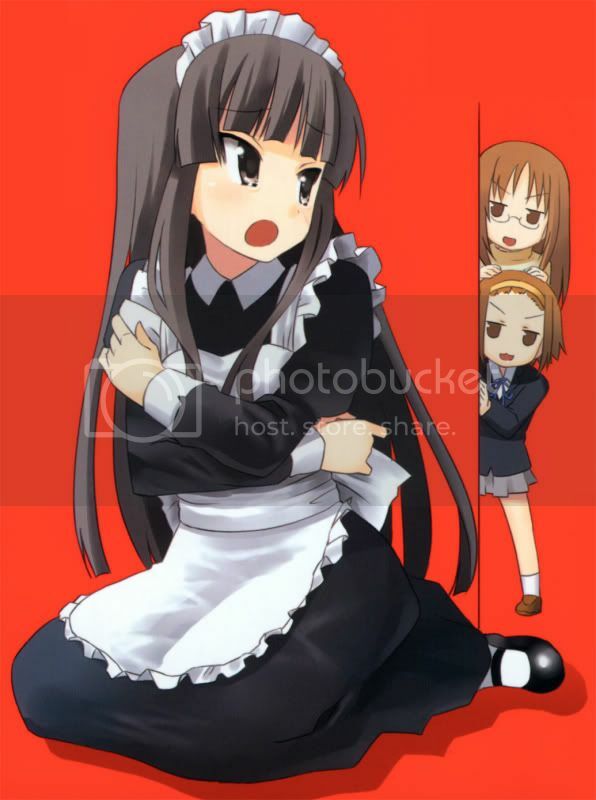 Probably because Mio always tries to "fix" Ritsu's comments/remarks/etc. up... which Kagami also does. Too bad though, Mio isn't exactly Tsundere I was hoping for a Kagami G2 when I saw her in the previews. She already is most people favorite character! Location: A small unobtrusive hut. Hmm, it's more of a tie between the four girls for me. They all have their good points, which makes them all so likeable. That's another thing I like about KyoAni. They actually take the effort to animate different casual wear. ...For the life of me, I actually can't think of another studio that does this on a regular basis. Maybe I'm just forgetting something though. Not to mention facial expression and matching the lip movements. In any case, I have surrendered to the Mio fandom. I agree with whoever said that seeing her blushing is almost as cute as seeing a tsundere blush. The fact that she's got a great voice only adds to the appeal. Mio for the win!! Hehe, Mio has a power ! Mio is just the whole package of everything that is right with character structure. Yes this is one thing I like about KyoAni too. Makes the anime characters "REAL" in someways. Since most anime and US cartoons, they've been wearing the same dress again over and over each episode. Also seeing the Mio there with more clothing changes in just 2nd episode, she's the most dressed up girl in K-on. Damn merchandising figure department won't have problems with her. Figma is the way to go - not least since they'd be likely to throw in the instruments, too. 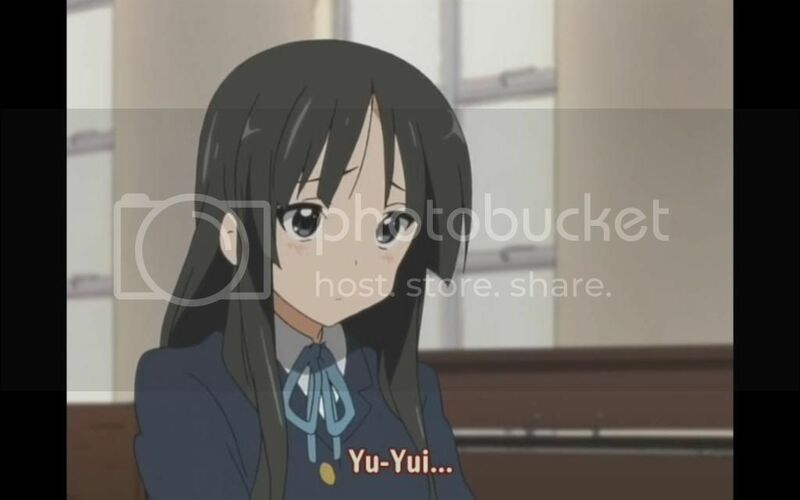 I think KyoAni is too obvious that everyone is supposed to love Mio. Way too many "Oh look how cute she is!!!" - scenes and pictures, and it feels like the other characters get pushed aside by the massive fandom of Mio. Both Figma and Revoltech did figures with instruments namely for Figma Nagato Yuki witch version and the vocaloids. Revoltech did Detroit Metal City, Bunny Haruhi and their version of Nagato witch. Personally I like the figma figures. Though revoltech gives a little more meat on the figures.